Adam по лучшей цене и бесплатной доставкой по Санкт-Петербургу. ADAM Audio основали Клаус Хайнц и Роланд Штенц в 1999 году. Последний покинул ее в 2010 ради своего нового детища, EVE Audio. ADAM — один из ведущих производителей активных студийных мониторов, чьи продукты получили множество благосклонных отзывов и рецензий от пользователей. Компания представлена на рынках более шестидесяти стран с подразделениями в США, Великобритании и Китае. Active 2 Way Bass Reflex Speaker Consists of: 7" Carbon/Rohacell/Glass Woofer with 100 W and X-A.R.T. Tweeter with 50 W High Shelf: > 5 kHz ~ thomann +/-6 dB Low Shelf: < 300 Hz ~ +/-6 dB Frequency range: 42 Hz - 50 kHz Transition frequency: 2,5 kHz Pea.. 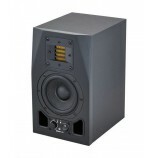 Active 2 Way Bass Reflex Speaker Consists of: 5,5" Carbon/Rohacell/Glass Woofer with 50 W and X-A.R.T. 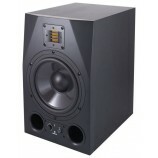 Tweeter with 50 W High Shelf: > 5 kHz ~ thomann +/-6 dB Low Shelf: < 300 Hz ~ +/-6 dB Frequency range: 50 Hz - 50 kHz Transition frequency: 2,5 kHz Pe..
2-Way Active Bass Reflex Speaker Components: 4.5" Carbon fiber woofer with 25 WX-A.R.T tweeter Frequency range 60 Hz- 50 kHz Transition frequency: 2.8 kHz Peak SPL / pair thomann (1m): 106 dB Level control Input / Gain: +14 dB to - infinity dB Level control T.. 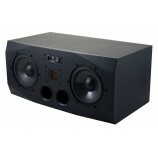 Active 2 Way Bass Reflex Speaker Consists of: 9" Carbon/Rohacell/Glass Woofer with 150 W and X-A.R.T. Tweeter with 50 W High Shelf: > 5 kHz ~ thomann +/-6 dB Low Shelf: < 300 Hz ~ +/-6 dB Frequency range: 38 Hz - 50 kHz Transition frequency: 2,3 kHz Pea.. 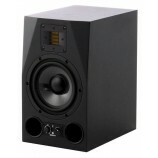 Active 3 Way Studio Monitor Left speaker 2x 7" Carbon Subwoofer with each 100 W 1x X-ART Tweeter with 50 W Control panel for Input Sensitivity High Shelf >5 thomann kHz Low Shelf <300 Hz and Tweeter Gain Inputs: XLR and RCA Frequency range: .. 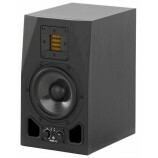 Active 3 Way Studio Monitor Right speaker 2x 7" Carbon Subwoofer with each 100 W 1x X-ART Tweeter with 50 W Control panel for Input Sensitivity High Shelf >5 thomann kHz Low Shelf <300 Hz and Tweeter Gain Inputs: XLR and RCA Frequency range:..